Shopping for Finding Nemo / Finding Dory Electronics? Join in the wild and crazy adventures with everyone's favorite forgetful fish Dory, with the Finding Dory My Friend Dory Talking Action Figure! Spark your child's imagination to recreate their favorite Finding Dory scenes to help Dory find her friends and family. 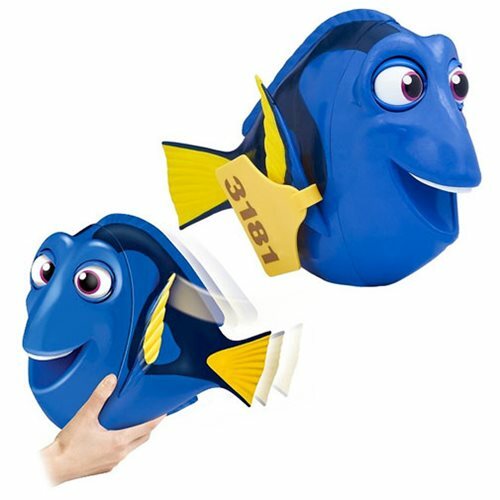 Take Dory with you wherever you go and as you move her she will react with phrases from the movie. Move her right, she has one response. Move her left and she'll say another phrase. Move her up, down... so many different phrases, she might even sing her favorite song! Touch Dory's fin and she'll start speaking whale! My friend Dory has over 50 different phrases and sounds! She even looks and feels just like she does in the movie, with real facial expressions and blinking eyes! Not for use in water. Ages 4 and up.